At the invitation of the government of the Republic of Korea (ROK), member of the Political Bureau of the CPC Central Committee and Director of the Office of the Foreign Affairs Commission of the CPC Central Committee Yang Jiechi will pay a visit to the ROK as the Special Representative of President Xi Jinping from March 29 to 30. Q: At the invitation of General Secretary of the Central Committee of the Communist Party of China (CPC) and Chinese President Xi Jinping, Chairman of the Workers' Party of Korea (WPK) and Chairman of the State Affairs Commission of the Democratic People's Republic of Korea (DPRK) Kim Jong-un paid an unofficial visit to China from March 25 to 28. General Secretary Xi Jinping held talks with Chairman Kim Jong-un. How does China think of the significance of this visit on China-DPRK relations? What influence will it have on the settlement of the Korean Peninsula nuclear issue and regional situation? A: At the invitation of General Secretary of the Central Committee of the Communist Party of China (CPC) and Chinese President Xi Jinping, Chairman of the Workers' Party of Korea (WPK) and Chairman of the State Affairs Commission of the Democratic People's Republic of Korea (DPRK) Kim Jong-un paid an unofficial visit to China from March 25 to 28. General Secretary Xi Jinping and Chairman Kim Jong-un held in-depth talks on China-DPRK relations and other issues of mutual interest. Chairman Kim Jong-un's first visit to China and the talks between the top leaders of China and the DPRK have testified to the great importance that the two sides attach to the relations between the two parties and two countries. The China-DPRK traditional friendship is the precious wealth of both sides. During the talks, General Secretary Xi Jinping stressed that it is an unswerving policy of the CPC and the Chinese government to maintain, consolidate and develop good relations with the DPRK. We are willing to work with DPRK comrades to continue giving play to the guiding role of high-level exchanges, deepen strategic communication, expand exchanges and cooperation, promote peaceful development and cement the public opinion foundation for China-DPRK friendship. By doing so, we will advance the long-term, sound and steady development of China-DPRK relations, deliver benefits to the two countries and two peoples and make new contributions to the peace, stability and development of the region. During the visit, the two leaders also had an in-depth exchange of views on the situation of the world and the Korean Peninsula. General Secretary Xi commended the important efforts made by the DPRK for those positive changes that took place on the Korean Peninsula since this year, reiterated China's relevant principled position and China's will to continue with its constructive role. 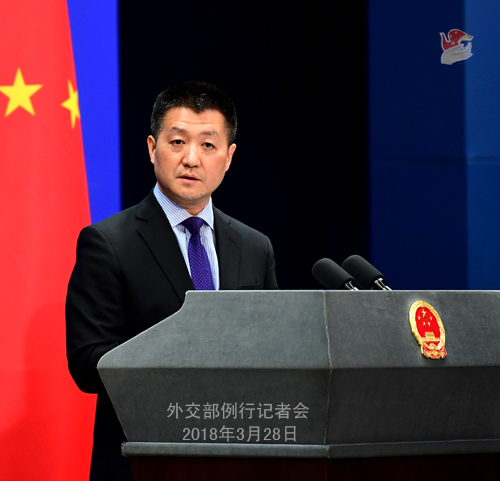 Going forward, we stand ready to work with the DPRK and other parties to, in combination with China's dual-track approach and other parties' useful advice, strive for the denuclearization, peace and stability of the Peninsula and the long-term peace and stability of this region and the world at large. Q: Now that Chairman Kim Jong-un has visited China and held talks with General Secretary Xi Jinping, relations between China and the DPRK have returned to a more steady and stable footing. Does this mean that China will consider relaxing the implementation of relevant UN Security Council resolutions? A: China always attaches high importance to China-DPRK friendly and cooperative relationship. As we stressed many times, China always stays committed to the goal of denuclearization of the Peninsula, upholding peace and stability there and properly resolving the Korean Peninsula issue through dialogue and negotiation. We have been playing a positive and constructive role under this principle regarding the Korean Peninsula issue. As a permanent member of the UN Security Council, China's will to fulfill its international obligations is beyond doubt. Q: The Korean Central News Agency's reports on Chairman Kim Jong-un's visit to China mentioned that General Secretary Xi Jinping already accepted Chairman Kim's invitation and said he would visit the DPRK at appropriate time, but we didn't see this part in the readout of the Chinese side. Can you confirm that? Why is it not mentioned by China's readout? A: China and the DPRK have the tradition of exchange of high-level visits. The high-level exchanges have played an important guiding and driving role in the development of China-DPRK relations all along. During the talks, General Secretary Xi Jinping explicitly pointed out that he is willing to keep frequent contacts with Chairman Kim Jong-un through various forms such as exchange of visits, sending special envoys and letters to each other under the new circumstances. We would like to work with the DPRK to firmly grasp the global development trend and bear in mind the overall picture of China-DPRK relations, strengthen our high-level exchanges, deepen our strategic communication, expand our exchanges and cooperation, and deliver benefits to the people of both countries and the people of all countries. You may need to read over the press release if you didn't take note of these contents. Q: Can you tell us when the invitation was extended by General Secretary Xi Jinping to Chairman Kim Jong-un, when Chairman Kim Jong-un accepted it and what goal, from China's point of view, has the meeting achieved? 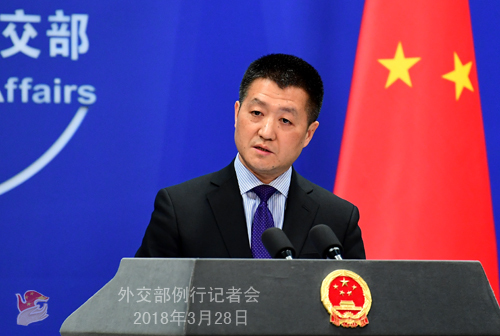 A: Regarding the timing and reason for this visit, I advise you to read over the press releases issued by both China and the DPRK, which have made that quite clear. With regard to the goals achieved through this visit and the talks between the top leaders of China and the DPRK, just now I have elaborated on that. 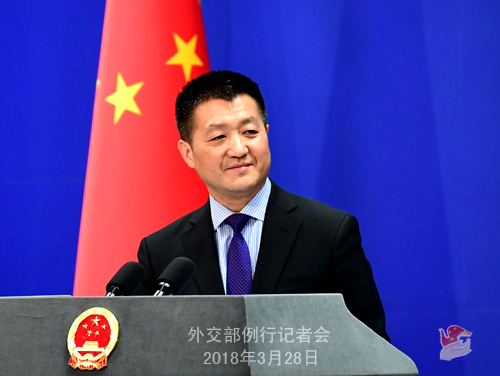 In terms of our traditional friendship and bilateral relations, both sides have confirmed that China-DPRK relations have been elevated to a new level in the new historical period. I have just said that the top leaders of the two parties and two countries had an in-depth exchange of views on the current international situation and the situation on the Korean Peninsula and reached many consensus. I advise you to read over the press release. Q: First, according to our information, State Councilor and Foreign Minister Wang Yi's visit to Russia was canceled. Can you confirm it? What was the reason? When will the visit take place again? Second, the White House announced that the Chinese government informed the US about the visit paid by Chairman Kim Jong-un, I wonder if the Chinese government informed the Russian side as well? A: As to your first question, I may need to correct you that State Councilor and Foreign Minister Wang Yi's visit to Russia is postponed rather than canceled. We said earlier that China and Russia agreed that President Xi Jinping's Special Envoy, State Councilor and Foreign Minister Wang Yi would pay a working visit to Russia from March 27 to 28. But as we all know, on March 25, a massive fire at a shopping mall in Kemerovo caused major casualties and property losses. You may have learned that the Chinese leaders sent messages of condolences to the Russian leaders immediately. Considering the major adjustments in the agenda of Russian leaders, China and Russia have agreed to postpone State Councilor and Foreign Minister Wang Yi's visit. As to your second question, China will surely inform relevant parties of the information about Chairman Kim's visit. Q: During President Xi Jinping's Special Representative Yang Jiechi's visit to the ROK, will he brief the ROK side on Chairman Kim Jong-un's visit to China? A: With regard to your first question, during his visit to the ROK, Special Representative Yang Jiechi will meet with ROK President Moon Jae-in and Foreign Minister Kang Kyung-wha and hold talks with ROK National Security Adviser Chung Eui-yong. This visit mainly aims to have an in-depth exchange of views with the ROK side on promoting China-ROK relations and properly addressing the Korean Peninsula issue. I do not know whether you have noted that the ROK side has also issued the relevant information. Q: According to reports, during the talks between the Chinese and DPRK top leaders, Chairman Kim Jong-un expressed the hope that the Six-Party Talks can be resumed. Can you confirm this? A: Just now I have said that during the talks between the Chinese and DPRK top leaders, the two sides had an in-depth exchange of views on the situation on the Korean Peninsula and reached many consensus. The Six-Party Talks serves as an important platform for promoting the settlement of the Korean Peninsula issue and striving to resume it at an early date represents a direction that all relevant parties should work for. We hope that all relevant parties can follow the principles and spirit of the September 19 Joint Statement to address each other's legitimate concerns in a synchronized and reciprocal manner and make concerted efforts to politically resolve the Korean Peninsula issue and achieve long-lasting stability and security of the Peninsula. Q: In February this year, the International Criminal Court (ICC) headquartered in the Hague announced a "preliminary probe" into human rights abuse in President Duterte's campaign against drug-related crimes, which the Philippines is unhappy about. Recently, the Philippine government officially notified the UN Secretary General of its decision to pull out of the ICC. What is China's comment on this? A: We have said before that since he took office, President Rodrigo Duterte has firmly cracked down on drug-related crimes and improved public security, which creates the sound environment for the Philippines' economic development and its people's peaceful life and wins full approval and wide support at home. The international community should give more understanding and support to those efforts instead of pointing fingers and casting blames. China always maintains that the ICC should respect the sovereignty of nations, act cautiously and avoid being used as a political tool. China believes that a sovereign country has the right to say no to political manipulation under the cloak of law. Q: According to reports, on March 27, the high-level meeting on the Afghan issue was held in Tashkent. What is your comment? A: The high-level meeting on the Afghan issue has been successfully held in Tashkent. On March 27, Vice Foreign Minister Li Baodong led the Chinese delegation to attend this important meeting. The attendees held discussions on such topics as the Afghan reconciliation process, jointly countering the threat posed by terrorism and promoting regional economic cooperation and inter-connectivity. They reached broad consensus and adopted the Tashkent Declaration. At the meeting, Vice Foreign Minister Li Baodong expounded on China's policies and propositions on the Afghan issue and elaborated on the efforts made by China to support the peaceful reconstruction and reconciliation process in Afghanistan. He expressed the hope that the regional countries and international community could continue to step up their efforts to assist Afghanistan in advancing peaceful reconstruction and national reconciliation process and effectively countering the threats posed by terrorism and drug trafficking, support Afghanistan's efforts to actively integrate into regional cooperation, and jointly make relentless efforts to promote lasting peace and common prosperity of Afghanistan and the region. Q: According to the Vietnamese media, a Chinese film was banned in Vietnam because some contents in it were related to the South China Sea. Are you aware of this? A: China's position on the South China Sea issue is consistent and clear-cut. There is no need for me to restate it. The film mentioned by you is a work of art and the story is fictional. We hope that all relevant parties can refrain from making unnecessary connections and reading too much into it. Q: According to reports, the Japanese Liberal Democratic Party adopted a draft proposal to revise the Constitution at a party convention recently, adding provisions on the Self-Defense Forces (SDF) to Article 9. The Liberal Democratic Party also listed the revision of Constitution as a goal in the guidelines of its activities in 2018. Shinzo Abe said that he would include the stipulation of the SDF in the Constitution and worked for the goal of constitutional revision. There are many different opinions about the LDP's attempt to revise Constitution in Japan. What's your comment? A: Due to what happened in history, the issue of Japan's revision of the pacifist Constitution has been closely followed by the victimized countries of the Second World War. We hope that the Japanese side will draw lessons from history, take heed of the call for peace by people at home and abroad, adhere to the path of peaceful development and take concrete actions to win the trust of its Asian neighbors and the international community. Q: According to reports, a Chinese delegation is expected to hold talks with officials from the Vatican in Rome this week. Can you confirm this information? A: I have no information to offer to you. I would like to stress once again that China is always sincere in improving China-Vatican relations and has been making unremitting efforts to this end. We are willing to work with the Vatican to strive for the progress in our constructive dialogue and the improvement of our ties. Q: According to reports, on Monday and Tuesday this week, Indian and Chinese officials met in Hangzhou for talks on an expert-level mechanism on trans-boundary rivers. Do you have more information? Would China agree to share hydrological data for both Brahmaputra and Sutlej rivers with India this year? The Indian government said that the data was not supplied last year. A: We have taken questions raised by the Indian journalists on the flood reporting cooperation between China and India on this podium before and introduced the relevant situation on the ground. I believe that you are all aware of that. 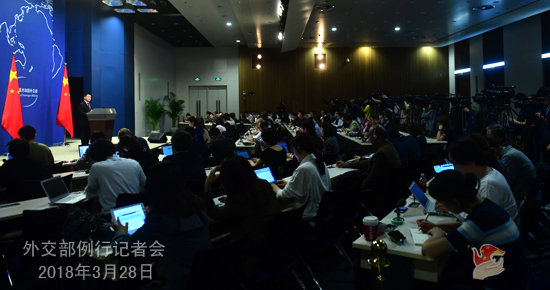 Just as you said, the 11th meeting of the China-India expert-level mechanism on trans-boundary rivers was held in Hangzhou from March 26 to 29. The two sides took stock of the previous meetings under the expert-level mechanism and the bilateral cooperation on flood reporting and emergency handling and agreed to continue with the cooperation on trans-boundary rivers in accordance with the relevant consensus. China stands ready to follow the humanitarian spirit and the goodwill of developing China-India ties to continue with the flood reporting cooperation with India through the existing channels. Q: During Chairman Kim Jong-un's visit to China, has the Chinese side offered to host the upcoming summit between the DPRK and the US. If so, what was the DPRK's response? A: Since the beginning of this year, we all noted that the situation on the Peninsula is improving and important steps have been taken in the right direction for the settlement of this issue. We have said many times on this podium that China is willing to support all the efforts, regardless of their form or arrangement, that are conducive to promoting the dialogue and reconciliation between relevant parties and further easing the situation on the Peninsula. Q: Regarding the press release issued by China on Chairman Kim Jong-un's visit, can you offer us more details? A: Isn't the press release issued by China detailed enough? The TV news coverage lasted about 14 minutes with a total of roughly 3,400 characters. Q: Just now you said that China will continue flood reporting cooperation with the Indian side, can we infer that from this year onward that China will share the relevant hydrological data with India? A: I have made myself clear just now. China has said that it will follow the humanitarian spirit and the goodwill of developing China-India ties to continue with the flood reporting cooperation with India through the existing channels. Q: Firstly, according to the official media, Chairman Kim Jong-un paid an official visit to China from March 25 to 28. Today is March 28 and has his visit ended? Has Chairman Kim Jong-un returned to the DPRK? I think this is not clear enough. Secondly, some reports said that this is a "secret visit". Do you agree with that? A: With regard to your first question, I have made it clear that Chairman Kim Jong-un's visit was from March 25 to 28. I believe that it cannot be more clear-cut. As to your second question, if this were a "secret visit", we would not release the relevant information. Q: Is there a timetable for General Secretary Xi Jinping' visit to the DPRK in return? Will that take place before the DPRK-US leaders' meeting? A: As I said just now, the readouts released by both China and the DPRK have made it very clear. First, the exchange of high-level visits has been a very good tradition between China and the DPRK. Second, during the talks of the two top leaders, both General Secretary Xi Jinping and Chairman Kim Jong-un expressed their will to keep frequent contacts through various forms such as exchange of visits, sending special envoys and letters to each other. In particular, the two sides have agreed that the guiding role of high-level exchanges is very crucial to furthering the relations between the two parties and two countries.